When your child's birthday is in February, or a thunderstorm threatens your pool party, indoor party games are an invaluable resource. Have plenty of fun and favorite games ready to go so you can host a great party, no matter what the weather. When deciding on games for preschool kids, be sure to include games that will be fun no matter what skill ability that they may have. Professional party planner and author Lisa Kothari points out that "when children are three and older, they will be very excited to attend the party and participate in the activities." She adds, "Children younger than three may not be interested, have a long attention span, or may even be shy and may not want to participate as a result." Kothari also mentions that "for these very young children, make sure their parents are available to participate with them and engage them in the activities." She suggests the hosts "make the games very short and easy, so it doesn't take too much time." Traditional games that children have played before are good options as the kids will be familiar with both the rules and game play. This game is fun and will get the kids moving around. You can play popular music to get them excited for the game. To play, you will have a few less chairs than kids. Play music then when it stops everyone tries to sit in a chair. Whoever doesn't get a chair is out. As the game goes on, take away chairs until just one is left. The first child to reach the chair is the winner. This games requires no props making it easy to play no matter where you are. The object is for the kids to follow instructions that you say. For example, Simon says clap your hands, hop on one foot, sit down, do a spin, etc. If someone does it without you saying "Simon Says", they are out. The child left standing is the winner. Modify it by using the child's name who is doing the calling or, if it's being played at a birthday party, the birthday honoree's name instead of Simon. An adult or teen can be Simon while supervising the game, too. This classic game can be done with a twist. Instead of a donkey, use your child's favorite animal. You can use anything from a cat to a monkey. Create a large picture of the animal and several tails cut out. You can draw an X on where the tail should go. Blindfold the children and have them stick on the tail where they think it should go. Mark the children's names where they stuck the tail. The child closest to the actual tail spot is the winner. Kothari suggests you can spoof this game and using another variation such as Puppy, Puppy, Dog or Kitty, Kitty, Cat to fit your theme. For this game, kids sit in a circle and one goes around tapping the others on the head, repeating the first part of the saying ("duck") until declaring someone the "goose." Whoever is the "goose" gets up and runs around the circle, trying to tag the person doing the tapping. This continues until the last child has either been called a goose or until all the children have been tagged out, however you choose to play the game. For this game, one child holds a balloon. He calls out another kid's name and lets the balloon go. The other child must catch the balloon before it lands on the ground. He is "it" next. Continue until all the children have had a chance to be "it". You can put a twist on the classic hot potato game and use an item that goes with the party theme. For example, if the party is during Valentine's Day, use a stuffed heart as the potato. To play this game, turn on music then begin passing around the item. Stop the music and whoever is holding the item is out. Keep playing until there are just two people left -- the one without the potato at the end is the winner. All you need for this game is some fun dance music. Have the kids dance and when the music stops, they must freeze. Any kid who is still moving when the music stops is out. The last one standing is the winner. This game is simple to play. 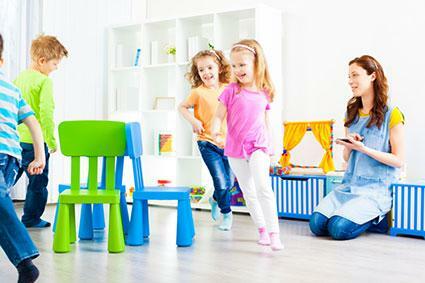 One child will stand in front of the group with his or her back turned while another takes an item, such as an apple, to hide behind another child's back. As a group, the kids will say "Apple, apple, who has the apple?" The child standing in front then turns around and guesses where the apple is. Then the child who had the apple behind them takes a turn. You can use other items as well such as a stuffed animal or a small ball. When planning games for older kids, make sure you include games that will keep everyone involved and feeling included. You may want to have additional help on hand as well. Kothari points out that "this is especially true when you are breaking down the full party group into teams for group games and activities." She notes, "if somebody isn't interested in participating, do not force participation, but allow this child to sit it out and watch." She states this it is important to "make sure someone is keeping an eye on this guest to make sure he is OK as an observer or can easily be included if he decides he wants to participate." Send a birthday message in whispers around the circle of guests. Let the birthday child be the last to receive the message and have him say it aloud! This game is sure to bring tons of laughs and can be played in several rounds. You will need several rolls of toilet paper for this game. To play, divide the kids into groups of two or three. One kid will be the one to be wrapped while the others are in charge of wrapping her from head to toe in toilet paper. You can set a timer and whichever team is the first to use the entire roll and wrap their teammate is the winner. This game takes more planning but is sure to be a hit. You will prepare several mystery boxes by cutting a hole big enough to fit a hand but not big enough to see into. In the boxes place objects such as peeled grapes, cotton balls, cooked noodles, rolled up socks, and jello. To play, each child will stick their hand in the box and guess what they are feeling without looking inside. The person who guesses the most correct will win. You can be as creative as you like with this game. For older kids, you can use more challenging items. This game is fun and can be as challenging as you like. To play, the kids will have to find objects you have hidden around the house. You can write a list of objects for them to find then divide them into teams to go on the hunt. Another option is to hide treasure hunt clues and have them find them as they go on the hunt. According to Kothari, the best situations when indoor party games are preferred are "when the weather is cold, snowy, and/or rainy. Also, even during a season like spring or summer, when it is usually beautiful outdoors, you should always have a Plan B with indoor games in case of rain as well." She adds that when deciding on games to include at the party that "parents should consider the number of children attending the party, the age of the children, and the space available to hold these games." She mentions, "space is an even more important consideration when deciding indoor games." Classic games, such as Pin the Tail and treasure hunts, offer plenty of tried-and-true options. Kothari notes that "games can all easily be spoofed to match your party theme", as noted above for the twist on Duck, Duck, Goose. Be sure to tailor the party games to the age and levels of the children attending. By offering a good mix of games, you can be sure everyone will get involved and have fun. Kothari suggests to "build up excitement for games by letting the kids know when they arrive about certain fun games they will be playing." She adds that "you may want to drop hints to get their interest piqued and excited to be involved!" 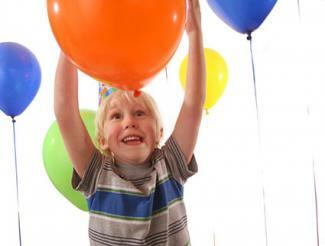 Kothari believes "No matter the budget or the amount of time a parent has, a great kids' party can always be planned." With this in mind, when planning to include games at your child's party, you can offer a great mix without breaking the bank or consuming a lot of your time. Games can be tailored to the party's theme as well as your child's interest. 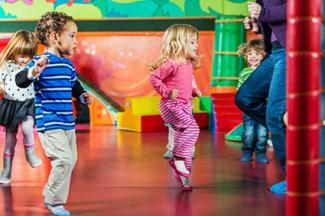 Offer a variety of games so that everyone will feel included and have fun at the party.